As part of our “Be Informed Lecture Series,” on Monday, 9 January, special guest Dr. Barry Morgenstern of Medical Arts Radiology presented an extraordinary lecture entitled “Understanding the Role of Imaging in the Diagnosis of Breast Cancer.” I believe if we hadn’t had a support group scheduled and Dr. Morgenstern didn’t have to leave to perform 10 biopsies, everyone would have stayed for hours to continue the insightful discussions. His warmth, sensitivity, commitment to his specialty, and clarity of the material created an incredible learning environment and left all of us feeling more knowledgeable about our bodies and our available resources. 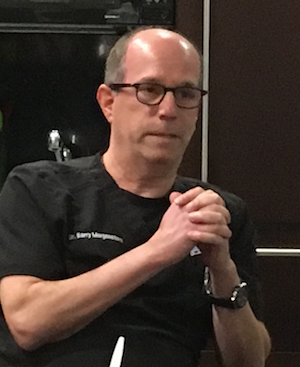 Dr. Morganstern detailed how each breast cancer diagnosis presents on various imaging procedures – such as mammography, tomosynthesis/3D mammogram, breast ultrasound, breast MRI, breast biopsy, and Pet/CT – and reviewed the process in which a radiologist interprets results from the various diagnostics procedures. 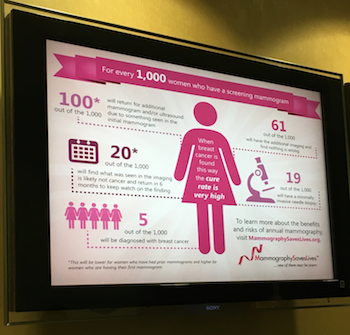 He also discussed the various misconceptions or misunderstandings related to each type of imaging as well as the pathology of breast cancer. Certainly, when entering into the land of a breast cancer diagnosis, not everyone is armed with the terminology or an understanding of diagnostic tools. It’s quite normal to turn on autopilot and robotically move through the slew of appointments, procedures, and diagnostics. Either from being overwhelmed or mentally checked out, people may not always be aware of what information they need to know or questions to ask. As part of our Patient Empowerment Program, the doctors and I feel strongly about the “empowerment” aspect by providing information which serves to increase awareness and assist patients in learning to be their own advocates. Medical Arts Radiology has nine locations and provides state-of-the-art diagnostic imaging services without the hassle associated with large medical facilities. To address the need for easy access to mammograms, they are installing a new, ground-breaking facility – PURE Mammography – at the Smith Haven Mall in Lake Grove, NY. No prescriptions are required. For more information about the facility and Dr. Morgenstern, visit their website: www.medartsrad.com. We sincerely thank Dr. Morgenstern for sharing his time and expertise to enhance the understanding of our patients’ diagnosis and treatment.